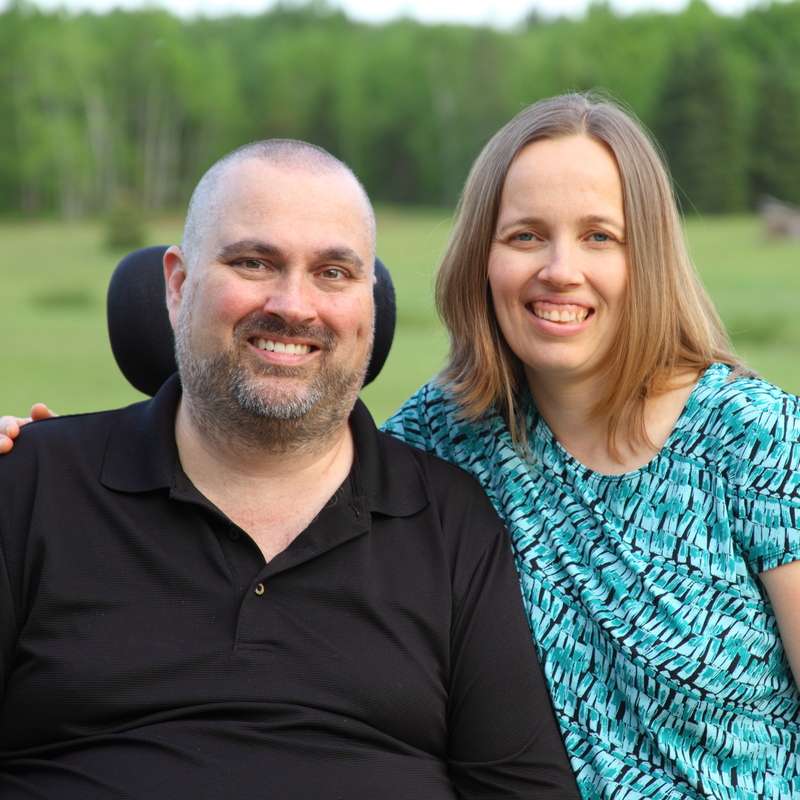 Todd and Kristin Neva, authors of Heavy, Finding Meaning after a Terminal Diagnosis, A Young Family’s First Year with ALS, seek to encourage people who are suffering through their book, blog, and speaking ministry. In June 2010, then 39 years old, Todd was diagnosed with amyotrophic lateral sclerosis, also known as Lou Gehrig’s disease, after experiencing weakness in his left arm. 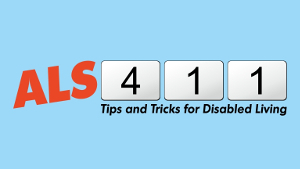 Although the average life expectancy for persons with ALS (PALS) is three to five years, 20% live five years or more. The disease progression for Todd has been relatively slow and his speech has yet to be affected. He has continued to lose muscle function in each of his limbs month after month and now requires the assistance of a caregiver, his wife. Todd Neva is a native of Minnesota, where he received a BS in Business and an MBA from the University of Minnesota. He worked in marketing research, finance and manufacturing for sixteen years before becoming disabled in June 2012. Kristin Neva is a native of Michigan’s Upper Peninsula. 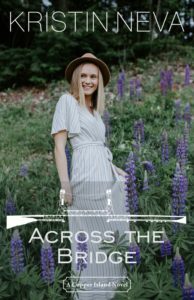 She graduated from Moody Bible Institute with a degree in youth ministry. Before becoming a stay-at-home mom, she was a full-time urban youth worker at the Milwaukee Rescue Mission where she wrote curriculum, taught Bible lessons, and coordinated an after-school tutoring program. 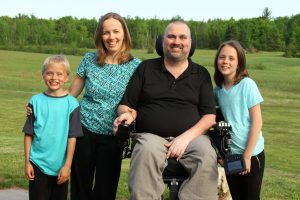 Prior to becoming disabled, Todd worked for a large manufacturing company in Racine, Wisconsin, where he and his wife Kristin lived with their two young children, Sara and Isaac. The Nevas relocated to the Upper Peninsula of Michigan to be near Kristin’s family. Todd and Kristin were married in 2003. Neva is pronounced: ‘nē-və, rhymes with Geneva. Heavy , Finding Meaning after a Terminal Diagnosis, A Young Family’s First Year with ALS was written to provide encouragement to people impacted by serious illness, disability, or a terminal diagnosis. After Todd Neva’s diagnosis of ALS in 2010, the Nevas read books by others who face grief and disability. They noted that many books deal with the author’s experience with illness retrospectively, often from the spouse’s perspective, or from the patient after some time has passed. The Nevas began writing their book in the first year of the diagnosis, when emotions were raw. 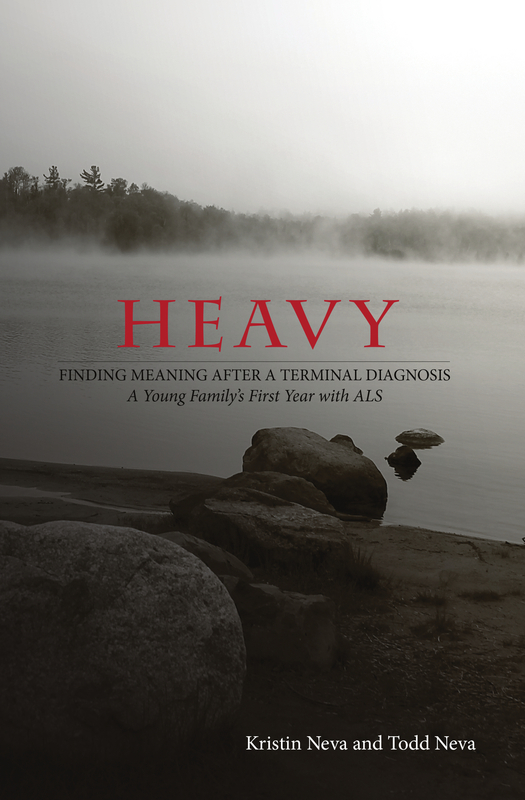 Heavy is an honest look at a young family’s first year after an ALS diagnosis. The story is told from Todd’s viewpoint (the Person with ALS). Todd’s wife, Kristin, writes journal entries that are interspersed with Todd’s account so the reader gets both angles—the person diagnosed and his supporting spouse. The dual voice of the patient and caregiver, man and woman, each sharing his and her perspective on a life-changing diagnosis, is uncommon. Although Todd has ALS, the book does not deal with the specifics of the disease or his care. The book focuses on the loss of dreams. Those impacted by other life-changing events may be able to relate to its message. Understanding God’s purpose in suffering. Heavy is available on Amazon and limited distribution in other book sellers. The list price for Heavy is $9.99 for the paperback edition and $5.99 for the Kindle edition. According to the Muscular Dystrophy Association, “ALS is a disease of the parts of the nervous system that control voluntary muscle movement. In ALS, motor neurons (nerve cells that control muscle cells) are gradually lost. As these motor neurons are lost, the muscles they control become weak and then nonfunctional. “The word ‘amyotrophic’ comes from Greek roots that mean ‘without nourishment to muscles’ and refers to the loss of signals nerve cells normally send to muscle cells. ‘Lateral’ means ‘to the side’ and refers to the location of the damage in the spinal cord. ‘Sclerosis’ means ‘hardened’ and refers to the hardened nature of the spinal cord in advanced ALS. MND, Motor Neurone Disease, is the generic name given to a group of diseases that affect the nerve cells that control voluntary muscles. Types of MND include Amyotrophic Lateral Sclerosis (ALS), Progressive Muscular Atrophy (PMA), Progressive Bulbar Palsy (PBP), and Primary Lateral Sclerosis (PLS). The Process of Grief and Finding Purpose in a Disabled Life. Audio sample: an interview with Mary Ann on WMPL Radio March 19, 2014. To request a speaking engagement, send an e-mail with your contact information to the info address at the top of the page in the header.